My wife and I are going to check out a few homes this weekend! We’ve wanted to buy a house for some time now and this weekend we finally begin. It is very exciting. I watch a ton of HGTV and DIY and I’m pretty sure I know how to tour houses. Thousands of people on House Hunters and Property Brothers (among dozens of other shows) have trained me well. First I have to criticize the flooring regardless of condition or type. Carget? Gross, I hate carpet. Wood floors? Terrible. Tile or laminate? When was this house last updated, 2010? Yes, people say that kind of crap every single episode. Second, any room of the house that needs a little work is a “total gut-job”. Even if the kitchen looks serviceable except maybe the counter-tops it’s a total gut job (it just is, that’s how it works). Third, and perhaps most importantly, comment on the paint color and lack of storage space. Even if these things are fine, comment on them, no matter what. If you’re a woman, say the closet will be big enough for your stuff and then cackle like the wicked witch. If you’re a man, say the closet might be big enough for her shoes (cackling like a witch is still highly appropriate). That’s it for the most part. If I follow these steps we’re guaranteed to be in our dream starter home in no time. It’s science. Map 37 was sent to me by my brother-in-law. 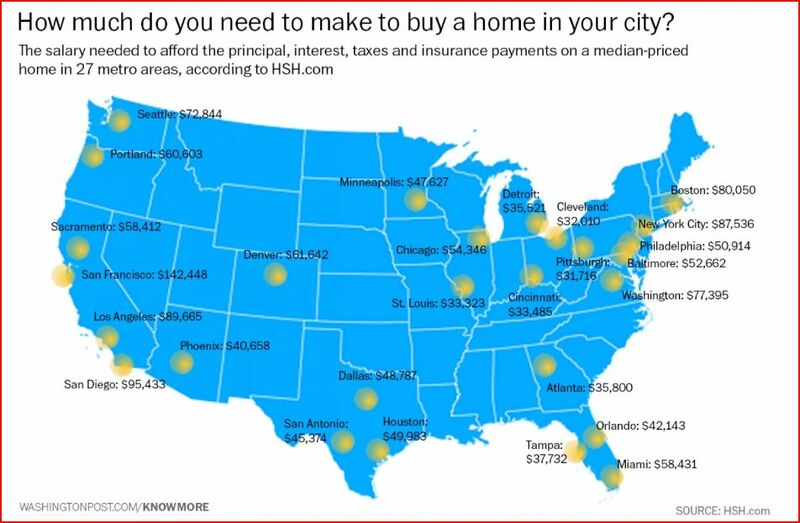 It shows the salary required to afford payments on a median-priced home across the country. $47,627 is needed to buy the average home in Minneapolis where we live, more than Detroit, Pittsburgh, St. Louis, Phoenix, Tampa and Atlanta. Compared to some other areas, though, we have it pretty easy. Look at the Northeast and the West Coast! San Francisco is the most expensive city on the map at $142,448 but LA, San Diego, New York City, and Boston aren’t so easy on the wallet either. Incomes are higher in those areas, obviously, but I’ll stick to my median-price median-priced starter home, terrible flooring and all! The MLS announced this week that Minneapolis has been awarded an expansion team to start play in 2018. For soccer and general sports fans in Minnesota this is great news! The franchise rights have been granted to the Minnesota United Football Club, current members of the North American Soccer League (the second tier soccer league in North America). The Loons currently play in Blaine, a Northern suburb, but this promotion to the majors requires a larger stadium be built in downtown Minneapolis. Our state just paid most of the tab for new baseball and football stadiums, something I approve of, by the way, so this soccer stadium is going to be mostly privately-funded by the United’s ownership group. Dr. Bill McGuire made millions as the CEO of UnitedHealth Group and he also has support from the families behind the Minnesota Twins, Minnesota Timberwolves, Minnesota Lynx, and Carlson hotels (so I think they’ll be fine). Blaine is a bit of a haul from here so I look forward to having the United closer to home. 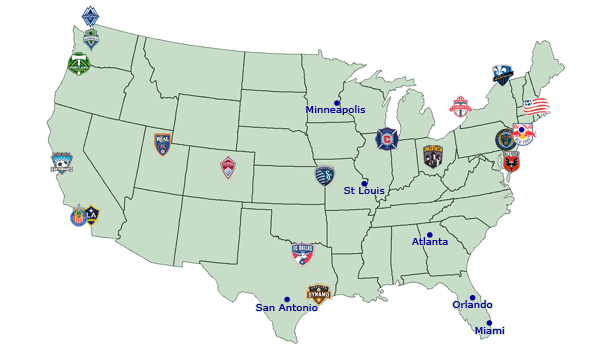 Map 38 shows all the MLS franchises and possible cities of expansion. The enlightened might notice the map is a little out of date. Orlando was given a franchise in 2013 and Chivas USA folded. The MLS currently has 20 teams but there are plans to expand to 24 teams in the next five years. Atlanta, Miami, and a replacement LA team are set to join in 2017 assuming Miami and LA can get stadium deals in place. As you can see in the map, San Antonio and St. Louis were also up for consideration to be the 24th team but Minneapolis won out. Of the four new teams, only Atlanta will be sharing a stadium with another sport (the Atlanta Falcons of the NFL). The league seems to want soccer-specific stadiums whenever possible because they provide a better experience for the fan. Would you rather be one of 25,000 people watching a soccer game in a 60,000 seat football stadium or be one of 25,000 in a sold-out soccer-specific stadium? I’ve seen the Houston Dynamo in action at BBVA Compass Stadium and the experience was great! I recommend soccer-specific stadiums all the way. Well that’s the maps for the week. An update; I started this post last weekend and we’ve now seen some houses. Don’t worry, I spared our realtor the home-touring nonsense I referenced earlier (mostly). We’ve seen 17 houses so far and based on what we’ve seen I am confident we’ll be able to find a good starter home in our price range fairly soon. I’ll keep you updated.